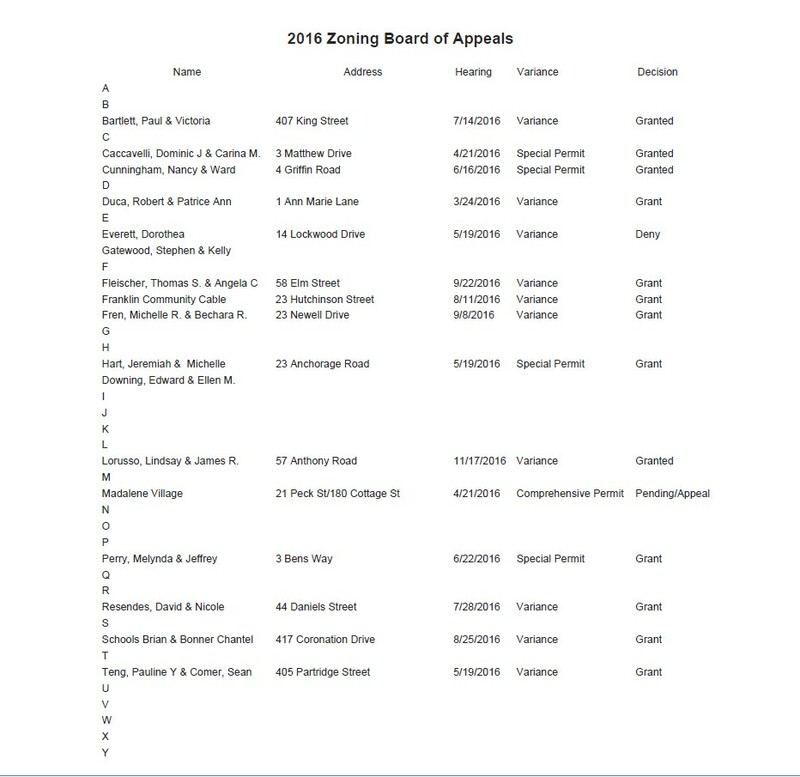 The Zoning Board of Appeals currently consists of three (3) members and two (2) associate members appointed by the Town Administrator, subject to the confirmation by the Town Council, for terms of such length and so arranged that the term of one member shall expire each year. There is currently one (1) opening for an associate member. The Board would like to thank Casey Thayer for her service as ZBA Secretary and we wish her well in her future endeavors. The Board of Appeals holds Public Hearings, as advertised, for Variance(s), Special Permits (including gravel removal), Findings and Chapter 40B applications. The Board also renders determinations on land use and zoning issues. All necessary forms and applications may be obtained through the Building Inspection Department and via the Zoning Board of Appeals website at http://www.franklinma.gov/zoning-board-appeals. The Zoning Board of Appeals meets in Town Council Chambers at the Franklin Municipal Building on Thursday evenings usually twice a month, at 7:30pm. 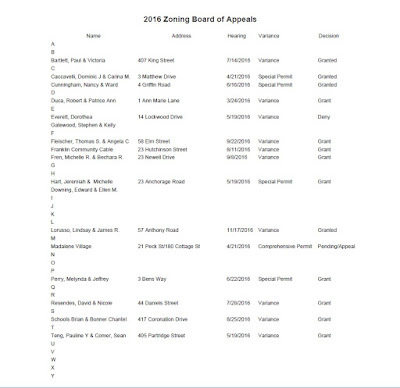 The calendar may be viewed via website at http://www.franklinma.gov/zoning-board-appeals. All meetings are open to the public. The Board has been very active this fiscal year and the following agenda is a list of all applications filed, indexed and recorded with the Town Clerk.